The S2Biom project - Delivery of sustainable supply of non-food biomass to support a “resource-efficient” Bioeconomy in Europe - supports the sustainable delivery of non-food biomass feedstock at local, regional and pan European level through developing strategies, and roadmaps that will be informed by a “computerised and easy to use” toolset (and respective databases) with updated harmonised datasets at local, regional, national and pan European level for EU28, Western Balkans, Moldova, Turkey and Ukraine. The project duration is 36 months and the activities started in September 2013. S2Biom is co-funded by the European Union within the 7th Frame Programme. Grant Agreement n°608622.The sole responsibility of this publication lies with the author. The European Union is not responsible for any use that may be made of the information contained therein. In this S2Biom newsletter issue, we would like to inform you about the progress of the toolset focusing particularly on the integrated tools developed: First the most recent updates made in the cost-supply database, then the ‘biomass conversion pathway matching tool’ and finally the full chain assessment tools of BeWhere and LOCAgistics implemented to a case study in Burgundy. The newsletter also includes a summary on a market review on the biomass demand foreseen up to 2030 when the production of biobased chemicals and materials further develops. Some events are announced in the end of the newsletter. Technical potential which represents the absolute maximum amount of biomass assuming the absolute minimum of technical constraints and the absolute minimum constraints by competing uses. Base potential which can be defined as the sustainable technical potential, considering agreed sustainability standards in CAP (Common Agricultural Policy) for agricultural farming practices and land management and as agreed in (national and regional) forestry management plans for forest biomass. This also covers legal restrictions such as restrictions from management plans in protected areas. User-defined potentials which vary in terms of type and number of considerations per biomass type. The user can choose the type of biomass and the considerations he would like to add and calculate the respective potential. It helps the user to understand the effect on the total biomass potential of one type of consideration against the other. Metadata display (specifying data sources used, short description of approach applied) for every data view selected by users. 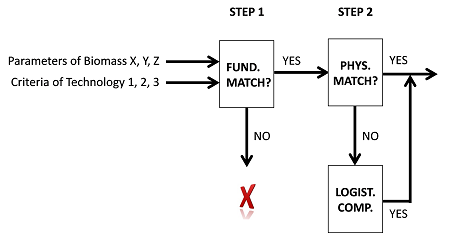 This tool, which is currently being developed, is expected to provide support to users for finding the best match between a certain amount of biomass with specific characteristics as specified in the cost-supply database and the appropriate conversion and/or logistical component and pre-treatment technology. Currently the following user interaction is implemented in this tool: A user selects from an extensive list one or more biomass types for which the best technology matches need to be identified. The tool then provides the suitable technologies based on the selection criteria specified in the knowledge base on conversion technologies. A distinction can be made between a fundamental match and a physical match. The fundamental match implies that the chemical composition of the biomass is in the range the technology can cope with. It is called ‘fundamental’ because it is very challenging to change chemical composition of a biomass strongly through pre-treatment processes. The physical match exists if the physical characteristics (e.g. volume, size and form, moisture contents) comply with the technology requirements. Physical characteristics can generally be further adapted through different pre-treatment processes and are more easy to alter than chemical characteristics. For the matches (‘+’) which the tool has identified, the user can then get detailed information on the characteristics of the conversion technology and the characteristics of the technology incorporated in the technology database and a mapped overview of the regions in Europe where there is enough suitable biomass available matching with the conversion technology. Two full chain assessment tools are currently developed within the toolset of S2Biom. Their development is done by incorporating an application of the tool for a case study in Burgundy in cooperation with the LOGISTEC project. The output generated from this project is used for the implementation of the identification and comparative evaluation of biomass delivery chains. BeWhere: The data from Burgundy case study is currently being incorporated in this tool in order to support the development of strategies for the cheapest and most GHG efficient ways to comply with an additional demand for electricity and heat purely based on local regional biomass resources. The case will focus on four types of biomass resources potentially available in Burgundy which are dedicated crops miscanthus, triticale and sorghum and straw residues. LOCAgistics: A local assessment tool for biomass delivery chains is also currently being developed for the Burgundy case study. It enables to further design and evaluate the solutions for additional biomass delivery chains proposed in the BeWhere solution for Burgundy. These solutions are translated in several biomass delivery designs using the variation in logistical concepts covering transport, pre-treatment and conversion options. The feasibility of every chain design can then be analysed in a comparative way (for different biomass delivery chains) in relation to environmental impacts (GHG emissions and mitigation including land use change emissions, soil C, soil erosion impacts potential and an economic minimum acceptable return analysis). It will take account of high resolution cost-supply information available at 250 m resolution grid. Once the Burgundy cases are working in the BeWhere and LOCAgitics tools the results will be validated with experts in the regions and new cases will be incorporated from regions in Spain, Finland and possibly other regions. One of the activities in the S2Biom project is a market review: “How much biomass demand can be foreseen up to 2030 when the production of biobased chemicals and materials develops further?”. The focus is on biomass demand for European production facilities (EU28, Western Balkans, Moldova, Turkey and Ukraine) and on lignocellulosic biomass feedstocks and their applications. So far, only few projections for future demand for biobased chemicals and materials are available, and none of them contains a translation back to a corresponding demand for lignocellulosic biomass. The key question in S2Biom is to what extent the additional demand for biomass from chemicals and materials could be sufficiently significant to influence lignocellulosic biomass prices and induce scarcity and competition issues with energy applications. For this review, the focus was on sectors that can create significant biomass demand, i.e. relatively bulky chemicals markets. Specialties and fine chemicals can have high added value and can therefore be most relevant for a biorefinery business case, but their production will by definition not induce bulky amounts of biomass demand. For the market analysis 11 product-market combinations (PMCs) were identified as possible significant consumers of biomass resources in the Pan-European area (see Table below). The focus was to quantify the demand for biomass feedstock for these PMCs in 2020 and 2030. For the PMCs related to biomass use for energy and energy carriers, conventional energy sector projections were used, such as the NREAPs. This applies to PMCs 1-3. For the mostly thermochemical pathways (PMCs 4-8), estimates of developments in the fossil-based reference material were available. With some expert judgements and logical reasoning, a range of possible biomass shares was estimated for 2020 and 2030. On the basis of conversion technology information and other sources, this was translated into a corresponding biomass demand. 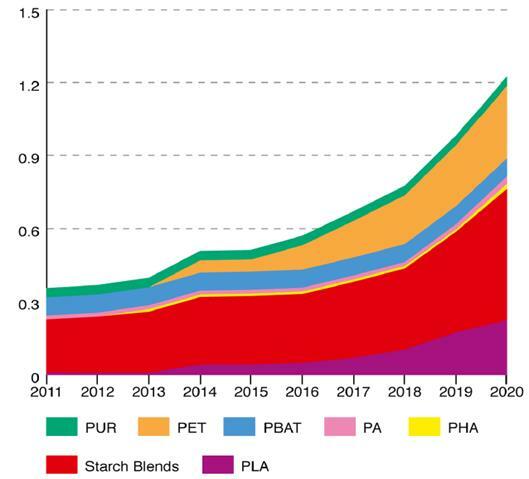 For the cellulose, hemicellulose and lignin PMCs (9-11), estimates were based on various studies specifically on biobased plastics (see Figure below), and other materials such as lubricants, solvents and surfactants. Data from literature and expert estimates were used to translate this into a corresponding biomass demand. PUR: Polyurethane, PET: Polyethylene terephthalate, PBAT: Polybutyrate, PA: Polyamide, PHA: Polyhydroxyalkanoate, PLA: Polylactic acid. Source: Dammer, L., M. Carus, A. Raschka and L. Scholz (2013): Market developments of and opportunities for biobased products and chemicals. NOVA Institute, Hürth. Next to the demand for energy, lignocellulosic biomass demand for chemicals and materials can run into millions of tonnes by 2020, and tens of millions of tonnes in 2030. Uncertainties are substantial, both in terms of technologies that are to be further developed, and in terms of supporting policies required. Besides, the oil price is a strong factor affecting the prospects for biobased chemicals and materials. Both the review results and the outcomes of the integrated assessment for which they will be used will be subject to stakeholder consultation in the project. Three joint events will take place from 29 September to 2 October 2015 in the JRC premises, Ispra, Italy: The S2Biom 3rd consortium meeting, workshop on Vision for the sustainable and resource efficient biomass in Europe and BISO workshop. The third consortium meeting is a private meeting where the consortium will meet to discuss the advancement of the project activities and plan future tasks. joint events. A briefing on the current status of bioeconomy and an outlook to biomass cost supply issues will be given as well. More information about the workshop is presented HERE. The so-identified gaps and consequently – the indicative plans for the future;The workshop is also open to the public.